USU Journal of Legal Studies (UJLS) is a peer-reviewed journal published by Faculty of Law University of Sumatera Utara two times a year in March and October. All papers submitted to this journal should be written in English or Bahasa. The aims of this journal is to provide a venue for academicians, researchers and practitioners for publishing the original research articles or review articles. UJLS is available in print and online version. The scope of the articles published in this jour- nal deal with a broad range of topics in the fields of Constitutional Law, Civil Law, Criminal Law, International Law, Administrative Law, Islamic Law; Economic Law; Adat Law; Labor Law; Agrarian Law; Intelectual Property Rights Law; Environmental Law and another section related contemporary issues in law. 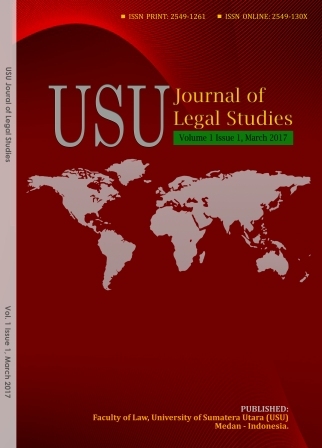 USU Journal of Legal Studies (ISSN Print: 2549-1261 | ISSN Online: 2549-130X) by http://jurnal.usu.ac.id/index.php/UJLS is licensed under a Creative Commons Attribution 4.0 International License. USU Journal of Legal Studies (UJLS) is a peer-reviewed journal published two times a year in March and October. All papers submitted to this journal should be written in English language. The editors, hence, is pleased to announce a Call for Papers for the next issue to be published in October 2017 edition.